Its sophisticated design means you’ll look and feel great taking it to any party, event, dinner or outing. It’s roomy enough to hold a full reservoir AND all your essentials including your keys, wallet, cell, and makeup. The durable leather-like bag is excellent quality and designed with comfort in mind. It can handle all your items (including the reservoir) while being comfortable on your shoulders. The hidden reservoir pocket means no one will ever know that you’re carrying a beverage inside. The hidden pocket is insulated, keeping your drink chilled for hours. The included reservoir (AKA: The Party Pouch) is BPA-free to keep you and the environment healthy. The designer flap on the backside means the spout is always concealed but easily accessible when you’re ready for your next drink. 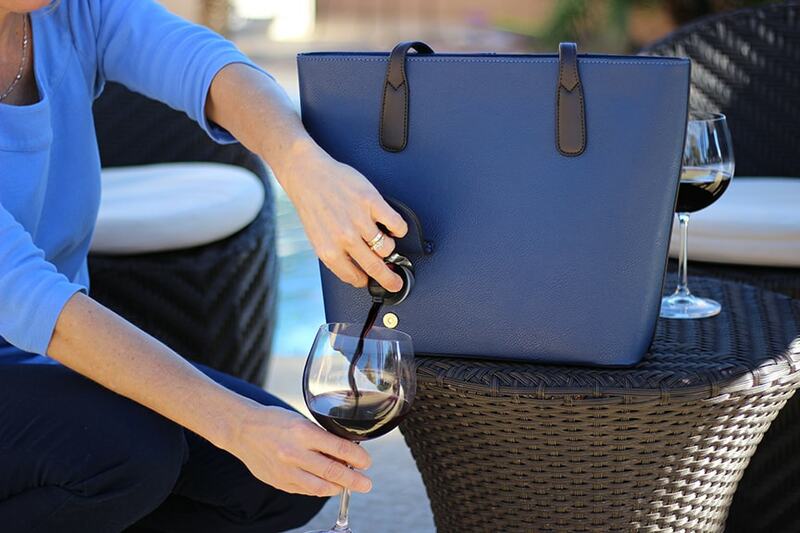 This purse will save you hundreds by never having to pay for another drink out again. You will be able to keep everyone hydrated – wine, mixed drinks, beer, water, tea or even juice for the kids! And our favorite… The PortoVino will almost always get a wild (and often times envious) reaction from your friends!